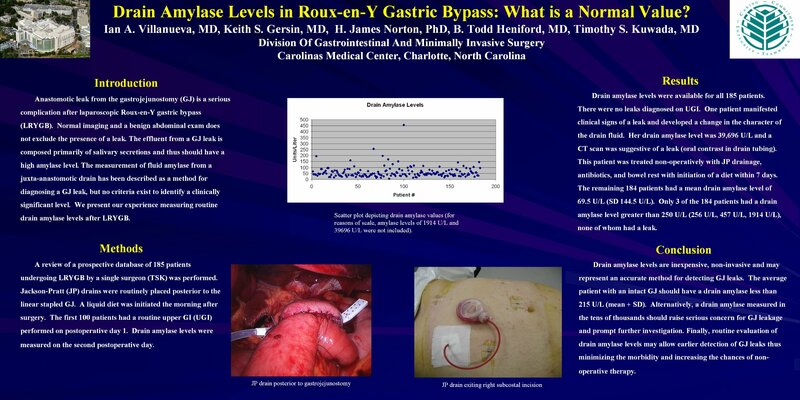 Drain Amylase Levels in Roux-en-Y Gastric Bypass: What Is a Normal Value? INTRODUCTION: Anastomotic leak from the gastrojejunostomy (GJ) is a serious complication after laparoscopic Roux-en-Y gastric bypass (LRYGB). Normal imaging and a benign abdominal exam does not exclude the presence of a leak. The effluent from a GJ leak is composed primarily of salivary secretions and thus should have a high amylase level. The measurement of fluid amylase from a juxta-anastomotic drain has been described as a method for diagnosing a GJ leak, but no criteria exist to identify a clinically significant level. We present our experience measuring routine drain amylase levels after LRYGB. METHODS: A review of a prospective database of 145 patients undergoing LRYGB by a single surgeon (TSK) was performed. Jackson-Pratt (JP) drains were routinely placed posterior to the linear stapled GJ. A liquid diet was initiated the morning after surgery. The first 100 patients had a routine upper GI (UGI) performed on postoperative day 1. Drain amylase levels were measured on the second postoperative day. RESULTS: Drain amylase levels were available for all 145 patients. There were no leaks diagnosed on UGI. One patient manifested clinical signs of a leak and developed a change in the character of the drain fluid. Her drain amylase level was 39,696 U/L and a CT scan was suggestive of a leak. This patient was treated non-operatively with JP drainage, antibiotics, and bowel rest with initiation of a diet within 7 days. The remaining 144 patients had a mean drain amylase level of 72.4 U/L. Only 3 of the 144 patients had a drain amylase level greater than 250 U/L (256 U/L, 457 U/L, 1914 U/L). CONCLUSION: Drain amylase levels are inexpensive, non invasive and may represent an accurate method for detecting GJ leaks. The average patient with an intact GJ should have a drain amylase less than 100 U/L. Alternatively, a drain amylase measured in the tens of thousands should raise serious concern for GJ leakage and prompt further investigation. Finally, routine evaluation of drain amylase levels may allow earlier detection of GJ leaks thus minimizing the morbidity and increasing the chances of non-operative therapy.